I’ve seen the Madagascar bulbul a few times, but today I got my first chance to take a clear picture. 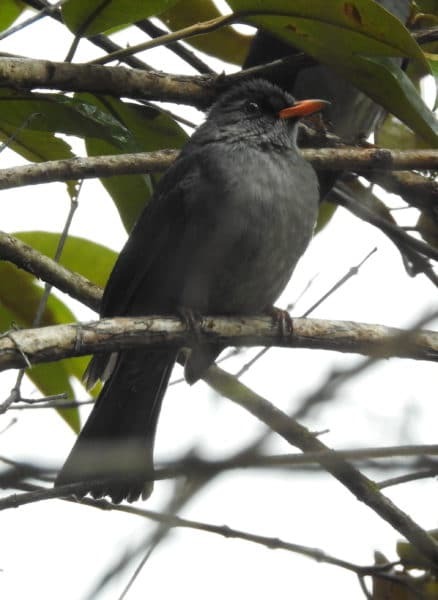 Although bulbuls exist in Africa, the Madagascar bulbul (Hypsipetes madagascariensis) is more closely related to bulbuls from Asia. The Hypsipetes genus is found only in Asia and the Indian Ocean islands. These birds have a distinctive call that sounds like a cross between 1980s videogame lasers and a cat’s meow. They also like to chatter a lot. They’re about the size of an American robin. And they’re everywhere. Well, maybe not everywhere, but they’re adapted to lots of different environments, including ones inhabited by humans. They often congregate on fruiting trees, and even if you can’t see them, you will hear them as they call to each other.